Good afternoon. 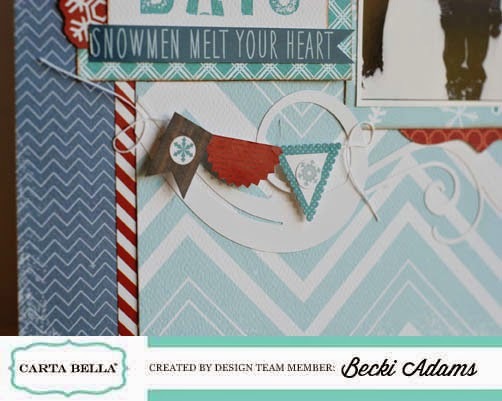 I'm excited to share with you a layout I created using the Bundled Up by Carta Bella and a few Carta Bella shapes from the Silhouette store. I love Winter collections especially Winter collections that contain bright colors. The Bundled Up collection has tons of beautiful blues and reds. I used this collection to document the only snowman my kids got to make last year. There wasn't much snow so there was only one snowman at our house. My kids were being so silly and their faces add a lot of whimsy to the page. I love using basic die cut shapes to add a little bit of extra detail to my layouts. 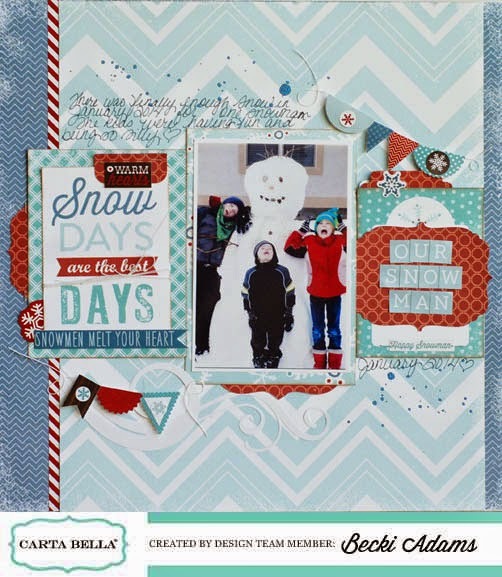 I used some basic shapes cut out of red patterned paper to add some extra layers for my details. I added lots of extra tabs and background shapes to this layout. Are there die cut shapes that you use over and over to create layers and details on your layouts? File tabs and basic shapes are some of my favorites to add to almost all of my projects.